The Dipping Sauce. 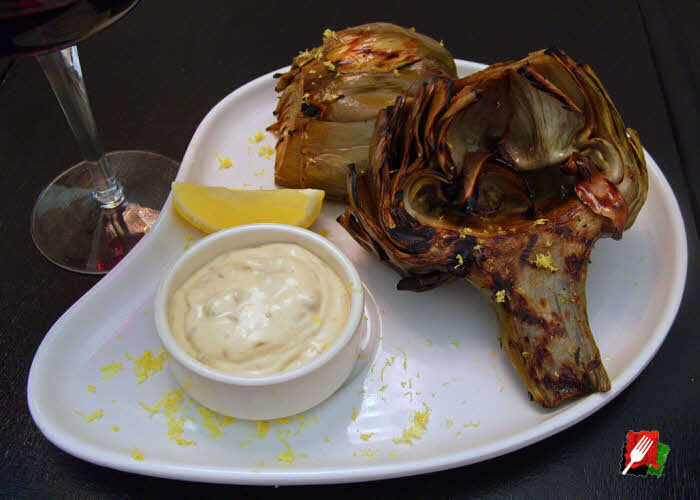 Grilled artichokes are delicious with a variety of dipping sauces. 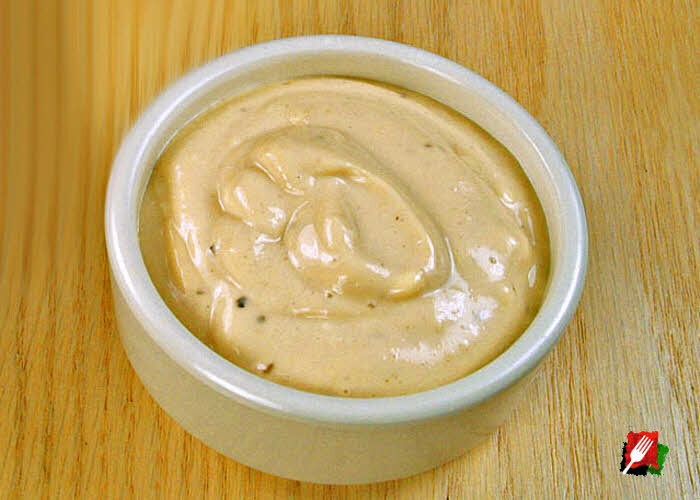 Many prefer our rich and flavorful Remoulade, others like our zesty Lemon Basil Aioli, and some simply prefer clarified butter. 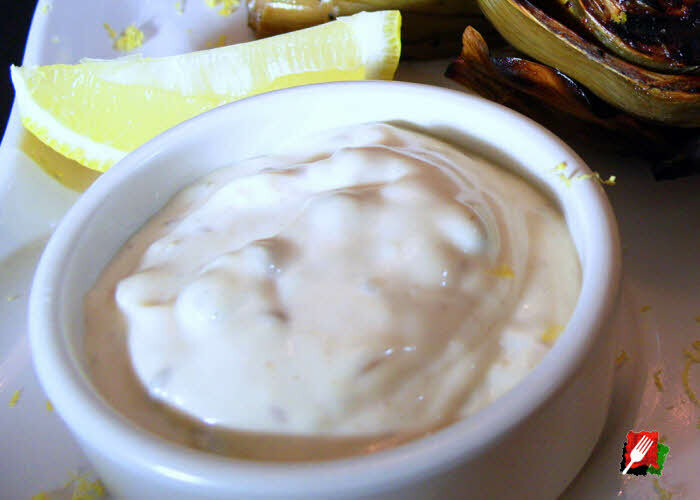 Below are the links to our favorite dipping sauces for this grill artichoke recipe. It is recommended that the sauce be prepared an hour or so in advance. 1. Prepare the Artichoke by using a sharp knife to cut off about an inch off the top of the artichoke, then cut the stem, leaving about an inch or two from the base of the artichoke. Use a peeler to remove the outer skin of the remaining stem. With kitchen shears, trim the pointed tops of the artichoke leaves. 2. Stir in the salt, garlic, and lemon juice in a deep saucepan containing cold water. Add the whole trimmed artichokes to the pan and bring water to a boil. Lower heat and reduce to a strong simmer, covered for another 30 minutes, or until stems pierce easily and the leaves will pull off. Fire up the grill and set to medium/medium-high while the artichokes are simmering so it’s ready when the artichokes are. 3. When done simmering, carefully remove the artichokes from the pan and place on a cutting board. Cut each of the artichokes in half lengthwise, then scrape out all of the inedible fuzzy choke with a spoon. Rinse well and place the halves cut-side down on paper towels to dry for a minute or two. Brush on the remaining half of the lemon juice, half of the olive oil, and season with salt and pepper. 4. With the grill preheated, add the 4 artichoke halves cut-side down on the grill. Let them cook for 3 minutes, then rotate 90 degrees on the same side and cook for another 3 minutes. Turn the artichokes over with the cut-side up, brush on the remaining half of the olive oil and salt and pepper into the cut leaves. Let cook until the leaves are lightly seared for another 3 or 4 minutes. 5. When done, remove from grill and serve 2 artichoke halves per plate, along with the dipping sauce of your choice, and garnish with lemon wedges and zest.